Fred and Linda Mangelsdorf, the husband and wife captains of “Young America” both grew up landlocked in the Midwest — Fred in Illinois and Linda in South Dakota. On Friday, they tried out their sea legs — or maybe that’s river legs — piloting their trawler on the Monongahela River. Neither had to be sold on the idea of living on a boat basically full time after both retired, she said. A trawler, both said, just made sense. It’s a livable boat that can navigate most waters. And the top cruising speed of 7 knots (around 8 mph) is perfect for people who aren’t in a hurry. It was Fred, in fact, who started thinking about the Mon River and the Mountain State. Barry Pallay likes that “Let’s go there” directive. He’s an avid whitewater kayaker and vice-president of the Upper Monongahela River Association (UMRA), a nonprofit watchdog group that champions the Mon and its tributaries here. In past few days, UMRA has watched the U.S. Army Corps of Engineers, which has floated the idea of limiting boat access or shuttering altogether select locks along the Mon — including the ones at Morgantown, and the Hildebrand and Opekiska lock systems downriver closer to Fairmont. 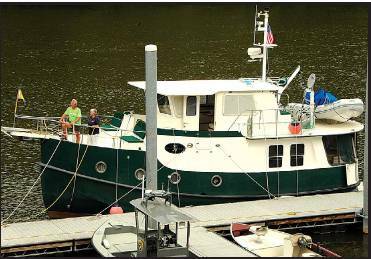 Should that happen, he said, there won’t be any return visits of for the Mangelsdorfs and other trawlers who enjoyed navigating the Monongahela River on Friday. A West Virginia lawmaker on Capitol Hill agrees. Rep. David McKinley, R.-W.Va., whose 1st Congressional District covers a lot of areas the Mon flows through, urged federal engineers Friday to not limit river traffic here. Doing so, he said would change the course of investment opportunities in the region’s energy and high-tech sectors. Joe Pica just wants a chance to pat the Mothman’s behind in Point Pleasant. He’s going to visit the statue of the mythical creature because Point Pleasant is on the way. The town sits along the banks where the Kanawha River meets the Ohio. If there’s a river, he says, there’s a reason to go. And every river town, he says, has its own fun, little oddities — be it a Mothman statue or a Jell-O Museum or a courtyard that’s home to the World’s Ugliest Fountain. “We love this stuff,” said Joe, who has been a full-time river cruiser since 2007. That’s when he turned in his shield and he and his wife, Kathy — everybody on the river calls her by her old childhood nickname, “Punk” — put their house up for sale so they could purchase their 30-foot trawlerstyled boat, the “Carolyn Ann.” Now, they drop anchor wherever there’s a dock, and sometimes where there isn’t. At this particular stop along the Monongahela River in Morgantown, they were joined by two other kindred couples in this waking, floating dream. Randy Semper, who grew up in Buffalo, N.Y., has been into boats for as long as he can remember. The 70-year-old spent his boyhood along the Erie Canal and bought a 16-foot roundabout when he and Barbara were newlyweds, 33 years ago. The 37-foot “Lazy Dolphin,” with its fully equipped kitchen, computerized wheelhouse and other amenities, trumps that first one, the retired statistician with the U.S. Department of Agriculture said, smiling. “Now, we just go where the water takes us,” Randy said.